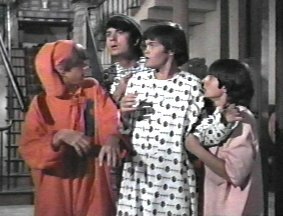 After confusing a lawyer with another, The Monkees find out they are inheriters in a will of late John Cunningham. At the Cunningham mansion, The Monkees (well, Davy) meets his grandniece, Ellie; as well as his butler, spirtualist and his traveling companion. The four boys find out that they inherited an organ, and Ellie finds out she inherited the mansion and everything else in it. The Monkees plan to leave, but misses the last ferry to Clarksville. At night, when the mansion is most spooky, two bodies are deemed to have been murdered, while one other disappears!! All contact to the outside world for help is unattainable. In the morning, Ellie refuses to keep the mansion, and soon after, all was not what seemed to be, maybe. the rent the first of September!" BABBIT: "Yeah, but that was for July!" you fix you'd promised to fix!!" BABBIT: "Fix? What fix? This place, this place is like a castle!" MIKE: "Yeah, well, okay in this castle the moat overflows!" PETER: "Yeah, the plaster's falling!" DAVY: "Yeah, and the phone doesn't work!" DOORMAN(? ): "I'm the twenty-three hour doorman." hour doorman, but I couldn't take the long hours." met the late Mr. Cunningham, I mean, even when he was early!" six hundred dollars! He always appreciated that!" MICKY: "Ah, Because it showed him our honesty!" RALPH: "Oh no, sir, because it wasn't his wallet!" out of 3 teenage marriages end in divorce!" MICKY: "Ah, 3 out of 3!" MIKE: "4 our of 3!!!" MIKE: Yeah, for the very first time today!!" MIKE: "Hello, operator? Operator, get me the police! We need--ah, hello? Operat--hello? Hello, operator, hello, hello? The wires been cut!" PETER: "They've been tied in a bow!" MICKY: "Well, at least, we know the murderer is very neat!" Um, there's already a message strapped to its leg!" PETER: "What does it say?" to my leg! I am not a carrier pigeon!'." ROSELLE: "I must warn Kingsley! I just had a vision! He's going to be shot in ten minutes!!!" PETER: "Hey, we just heard shots!" ROSELLE: "Oh, yeah?? My watch must be slow!" DAVY: "We're the only ones left." ELLIE: "I couldn't spend another moment in this house! I never want to see it as long as I live!" until the ferry comes. It shouldn't be too long." knock-out pills you experimented on?" MICKY: "Yeah, but the experiment is not complete." No novels were hurt during the making of this film.